Look what I found in the compost pile this morning! 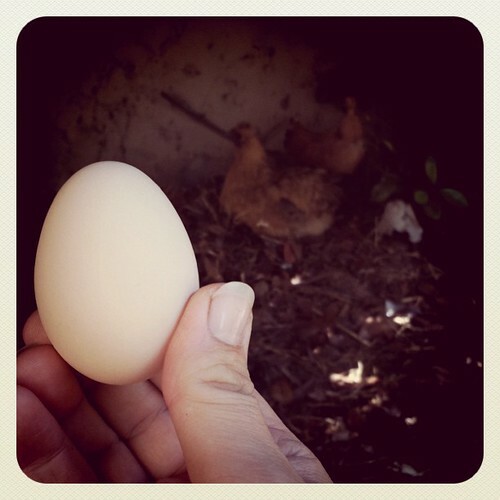 Our first chicken egg! My excitement at this awesome find is mixed with sadness because this means its time for LadyHawke to go back to the farm she came from. Her chicks don’t need her anymore and she is ready to move on. Anything exciting happen to you this weekend? We are talking about getting chickens. My mom has a couple she doesn’t want and we have a large unused dog kennel. We’ll have to put a lid on it before they live there. You can use lots of things to house chickens. Do an image search on google and you will find all sorts of ideas.